Minister of Agriculture on Nevis Hon. 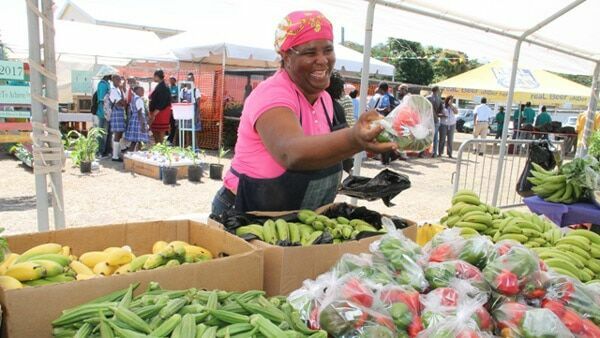 Alexis Jeffers, reiterated the importance of consuming locally produced food and urged the public to consume more. Mr. Jeffers, said the Nevis Island Administration continues to through its full support being the agriculture sector on the island as it continued to work towards greater food security. So far the move has brought about sustained success in agriculture. He said the increases in crop, livestock, plant and fisheries production, echoes the vision and thrust of the Ministry and Department of Agriculture which is reflected in the theme. The Agriculture Minister said the holistic and strategic approach taken by the Nevis Island Administration, to ensure the survival of agriculture, stimulate trade and promote healthy lifestyles has resulted in the increases. He explained that among the priority areas have been the reintroduction of onion production, increased production of cassava, sweet potatoes, coloured peppers, pumpkin and melons among others. Other initiatives include the re-cultivation of coconut trees at New River, the establishment of commercial green houses, increased efforts to reduce the monkey population, intensify support to the livestock industry, upgrading the government-owned Abattoir and veterinary clinic and working with primary schools to establish back yard gardens. In the area of agro processing, they have ensured that the Agro Processing Unit is provided with sufficient agricultural produce. He announced that a mango pulping machine had been sourced to deal with the excess mangoes on the island. The Agriculture Minister said consultation with farmers, livestock owners, fisher folk and others involved in agriculture continues on a regular basis, since their input must be what guides agricultural policies going forward. He also acknowledged a number of allied partners who continue to assist the Administration with training opportunities namely – the Inter American Institute for Cooperation on Agriculture (IICA), the Food and Agriculture Organization (OAS), the Republic of China (Taiwan) and the Caribbean Research and Development Institute (CARDI).